An interview with Chef Paul Kinny, Ex. 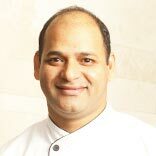 Chef, InterContinental Marine Drive. In an exclusive interview with Franchise India, Chef Paul Kinny talks about the menu trends, the new gastronomy and the tweaks he is applying into his restaurant to stand different in the crowd. I became a chef just to eat good food because there is no other profession which gives you good food to eat. Coming from a middle class family where nobody was from the hospitality background, I got admission in cooking school and decided to take that up as a profession. I started with the Taj Groups of hotels in 1992 and that formed the foundation of my career. I worked with them for ten years and then I was asked by Sachin Tendulkar to become a chef at his restaurant. That was how I left Taj. And after working with them for two- and-half years, I realised that it was not what I wanted because my expertise was always fine-dine. Then I went to Dubai. After serving there I came back and started conceptualising for the company. I conceptualised almost 12 restaurants, cafes and much more. I have been with Inter-continental from last five years. So, I think the journey was quite interesting and experimental. I think a chef, more than monetary or designation growth should be satisfied with the type of work he does. I think most of chef’s perspective works for them. For a chef, money doesn’t matter as long as he is happy with what he is doing or learning something or creating something that gives me immense amount of growth. As a chef I think there are two very important things to be said here. The first is your passion for cooking and the second is the ingredient because without any of these you cannot cook good food and today if you have the liberty to use good ingredient why shouldn’t you know at. For example; I am working with a Thai restaurant and we get our ingredients from Bangkok atleast twice in a week because you cannot get those ingredients in India. Even if you get the ingredients here you are not doing justice to the cuisine. So, we get all the vegetables and other ingredients from Bangkok because according to me authencity of the cuisine should be maintained. Ask any chef if you didn’t get high quality ingredients the good and authentic food can’t be cooked. I think today’s guest is well travelled; he knows about the world and has tried different cuisines. Ten years back when people were reluctant to try new cuisines. Today you see TV and Internet and you know about the master chef shows. So people know a lot about foods. Today it is very easier to get across to the people because they are willing to try and experiment. And I think people are more than ready to experiment the new dishes and the new cuisine. I take it for granted that my food is good because if the food is not good I don’t think that I am doing my job properly. So, the little tweaks that we add are in the form of presentation and what I have done is that I have made the food at my restaurant very interactive. So, if we have a lovely tasting curry, I present that in my restaurant in a paper cup which is made of fire proof paper with fuel below it. That keeps it warm and looks attractive too. It also keeps the food warm throughout the meal. Another tweak that we do is with the hot stone rice. We have a lava bowl that is imported from Japan. We heat them at a certain temperature on the flame. As it is the hot bowl, we cook the rice in that up to 80 percent and the rest 20 percent is cooked on the table near the guest where the chef would go with the hot stone bowl. He’ll add the sauce in it and mix it and cook it in front of the guest. That is the way I make my food very interactive where communication and the exchange of idea between the chef and the guest is happening. If you would talk about the Indian foods in India, the trends have not changed very much because as an Indian we are used to eating the food in a certain way. So if you talk about a French cuisine or a western cuisine, it is different. You can give a guy a portion of potato he will add sauce and eat it. However as an Indian we need lots of things- we want, rice, pulses, vegetables and many more things. That aspect has really not changed and that is the reason that the propelled food is not a hit in India. But what is happening is people are becoming health conscious- the salads have been included into the menu, the curries have become lighter as it used to be because the guests themselves are a bit conscious. So I see healthy twists to the menu happening and that is the trend coming forward in Indian food.